This week my good friend, artist Jane Iwan, did a post featuring a painting she had done from one of my photographs. Check it out at her site, Jane Iwan Studio. My original photograph is shown above. Jane’s comment, that it feels like stepping back to a different moment in time, captured my sentiments perfectly. Laos’ history is replete with feuds, warfare and painful treatment of its people. In recent times although the US supported Laos, it is said they suffered some of the worst bombing in the history of warfare as we attempted to destroy the Ho Chi Minh trail, a primary Communist supply route primarily located in Laos. Based on their history, it is no wonder their focus is on a simpler life of appreciation for family, freedom and basic necessities. Our visit to Laos was part of a much larger trip to Southeast Asia, a fascinating world so different from our own. The sights and smells of Bangkok, the wonder of Angkor Wat, the beauty of Ha Long Bay, the dichotomy of Saigon (Ho Chi Minh City) vs Hanoi and so many other fascinating experiences all helped us to understand and appreciate the people and places we’d only seen in books. 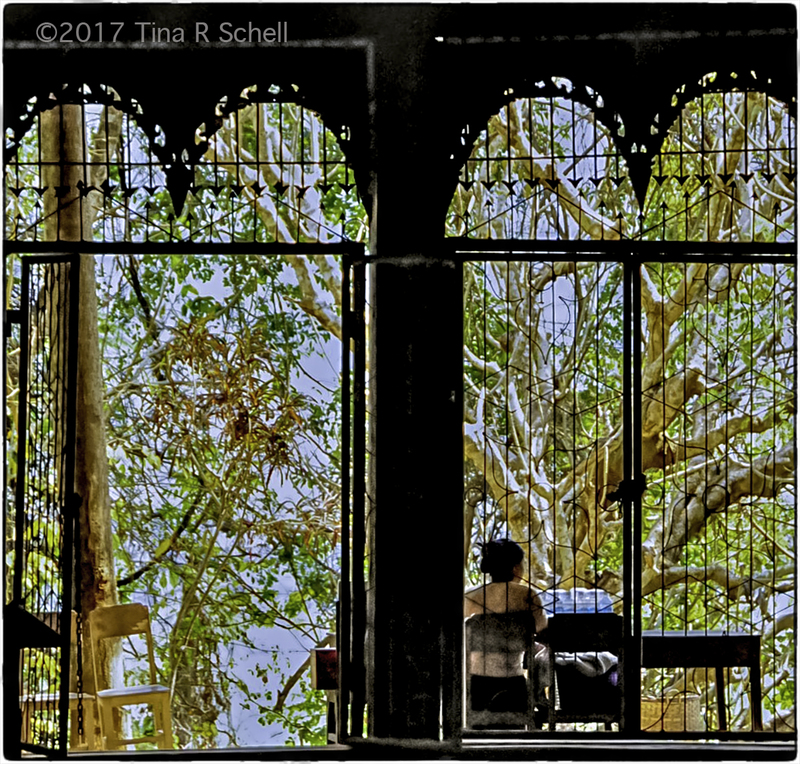 We saw some beautiful hotels and delicately scrolled ironwork, remnants of Laos’ time as a French Colony. Luang Prabang, the country’s capital city prior to the Communist takeover, is designated as a UNESCO World Heritage site known for its architecture and its preservation of Laotian heritage. It is also known as a Buddhist religious center. 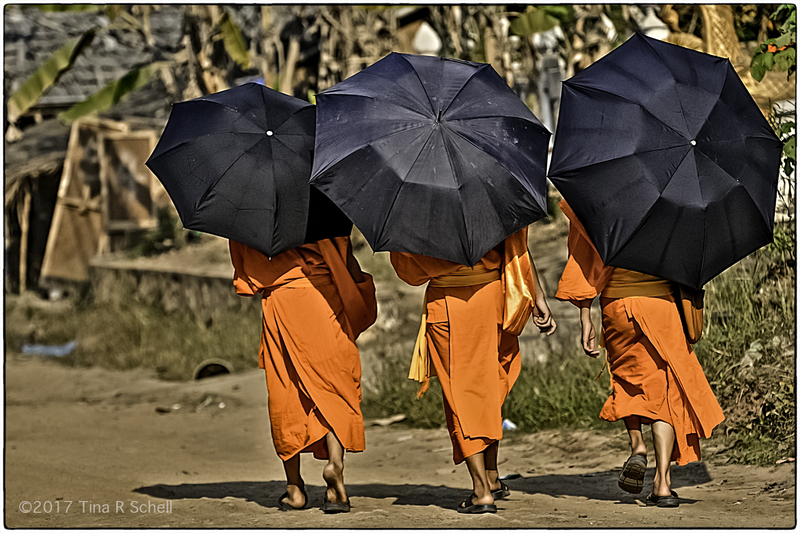 Each morning at dawn, hundreds of monks walk the streets of the city collecting alms – an amazing experience. Luang Prabang is considered by many to represent the heart of Laotian culture. Surrounded by mountains and located along the Mekong River, it is considered one of the most beautiful spots in Southeast Asia, and is one of their premier tourist destinations. 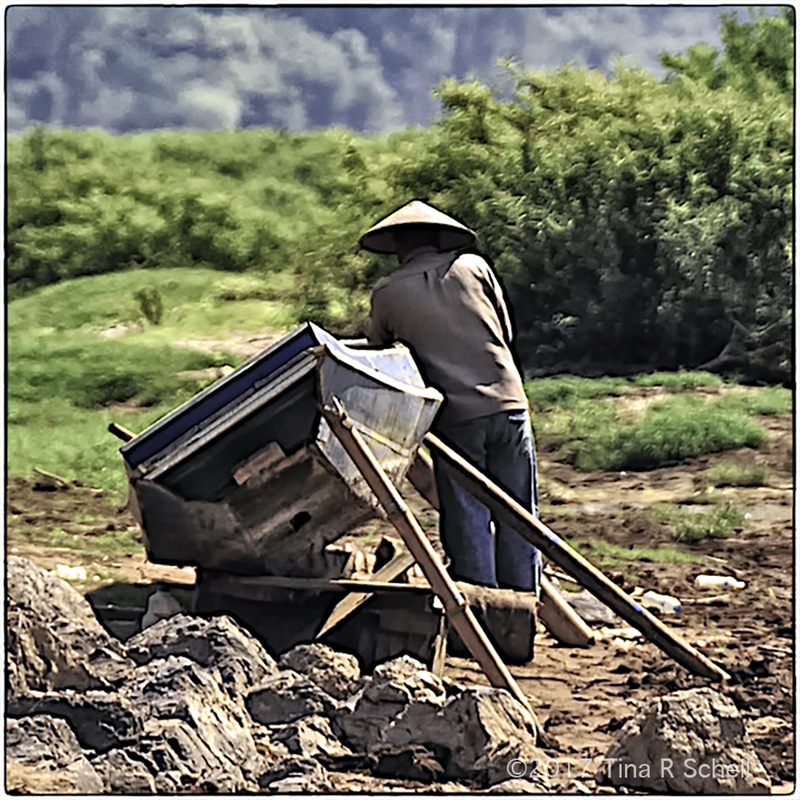 A leisurely boat ride down the Mekong helped us to appreciate the Laotians whose lives revolve around the river – fishing, boating or farming the shoreline. Finally, although my predominant memories of Laos were of a land of rather muted colors, it was in one of their night markets that I took one of my favorite photographs ever. 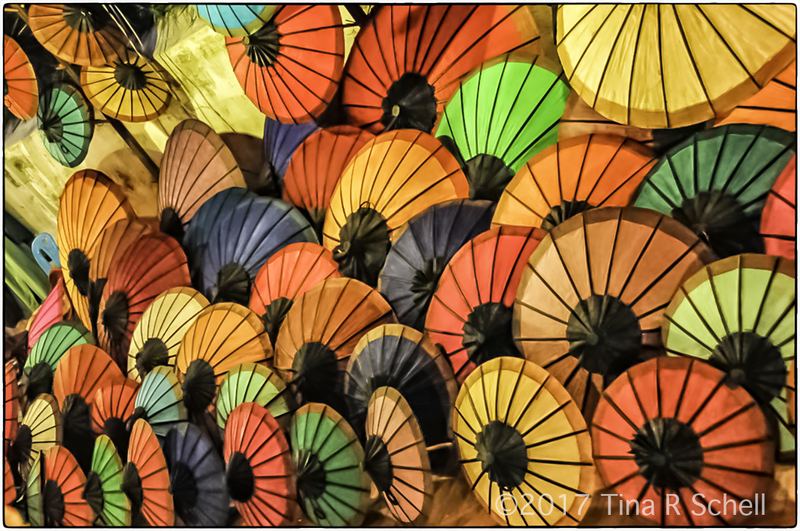 The display of colorful umbrellas spoke to me of pure joy. It is one of the few photographs I’ve framed in my own home, and makes me smile every time I look at it. What could be better than that? I can see why you’ve framed it, but I can’t see why you don’t frame lots more! A wonderful and fascinating post, Tina! The umbrella photo at the end has my heart singing with joy – it’s just glorious and I’m not surprised you have it up on your wall! 😀 What an amazing country, so varied, you bring it to life so well. Many thanks Annika, we had a great visit there! I can see why you like the umbrella photo. It struck me the moment it scrolled into view! Great shot and a great interpretation of the challenge! Thanks John – a very fond memory for me. Wspaniały post ze wspaniałymi zdjęciami. Wonderful post, Tina. I want to go there! That umbrella shot is begging to be enlarged and displayed. Beautiful work. Beautiful photos Tina – you need to frame more of your photos for your home!!! this entire post makes me smile😘 these are some of my very favorite shots…just so charming…what a GREAT eye!!! Beautiful captures, Tina. I appreciate the fact that you started the post with a brief introduction of the checkered past of the region. I’ve come to realise how little I know about the world. Thanks for sharing this. Thanks 2BF! I find it helpful when I travel to know something about the destination. Laos, Cambodia and Vietnam were real eye-openers for me. We tend to believe what we are fed and seeing those countries through the eyes of its people was quite educational. As usual, the truth is probably somewhere in the middle. 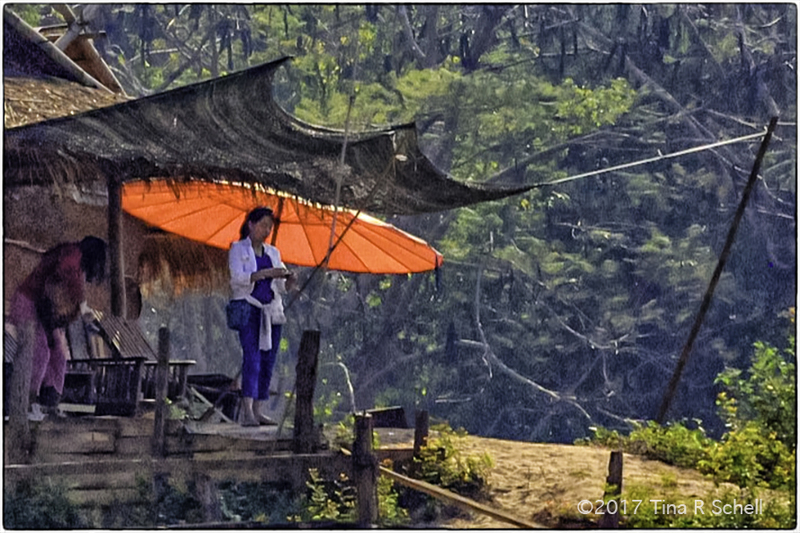 There sure is something about Laos, its colors and its people, that is soooo enticing and photogenic. The atmosphere there feels different and one just learns to take it easy if they didn’t know before. I’m with you all the way on that Juls – I too think it’s a a wonderfully peaceful place inviting one to sit back and contemplate the world around us. I also really like that umbrella photo. It’s easy to see why you would have chosen to print and frame it. Tina, this is such a perfect breath of fresh-tropic air for me today ~ wonderful series and you bring the ambiance of Laos into my office this morning. The opening photo is a great one to set the stage, but it is your through the looking glass photo that delivers me to this oasis 🙂 Your photos and words makes me wish I was in SE Asia right now – the snow and cold outside also playing a factor in this feeling as well 🙂 Wishing you a great New Year and a great week ahead. Take care! Interestingly, as soon as I saw that first image of the three monks, I wanted to paint it, only to see your friend has already done so. And very well, too. Superb images Tina, a place I am not likely to visit so I have enjoyed the journey with you. And the umbrella image must be fabulous on your wall. Such vibrancy it must make you smile whenever you pass by. Many thanks Jude. And appreciate your comment on the new colors. I had a reader tell me it was difficult to read on the black. Thank you Perpetua, much appreciated. Gorgeous colors and your photo and Jane’s painting were both awesome. Your sentiments and images captured it all beautifully. Tina these are spectacular photos ! I would love to see this part of the world. The first and last photo are my favorites. Truly stunning! Many thanks Nicole. Somehow I think you’ll get there one day! Inspiring! Not sure I’ll ever travel there, but your photo essay tempts me. I so agree, what can be better than smiling every time you pass by a loved image! Thanks Lindy, it was a great trip with many fond memories. The umbrella shot was icing on an already delicious cake! 🙂 These photographs are absolutely stunning. I love the colors and the composition, too. Many thanks HF, and a happy week to you too! Thanks Linda! If u love orange you’d REALLY love the monks! Great images full of ambience, but that umbrella shot is simply gorgeous. Such exquisite ambience in these photos. I can imagine that Laos has amazing ambience culturally. I have not been there yet I hope to go someday. Some of my very favorites in this group of photos! Wonderful photos. If the colours of the landscape are somewhat muted, the people seem to make up for that in their dress and decor. I agree, the people, esp the monks, do add color to the muted landscape! 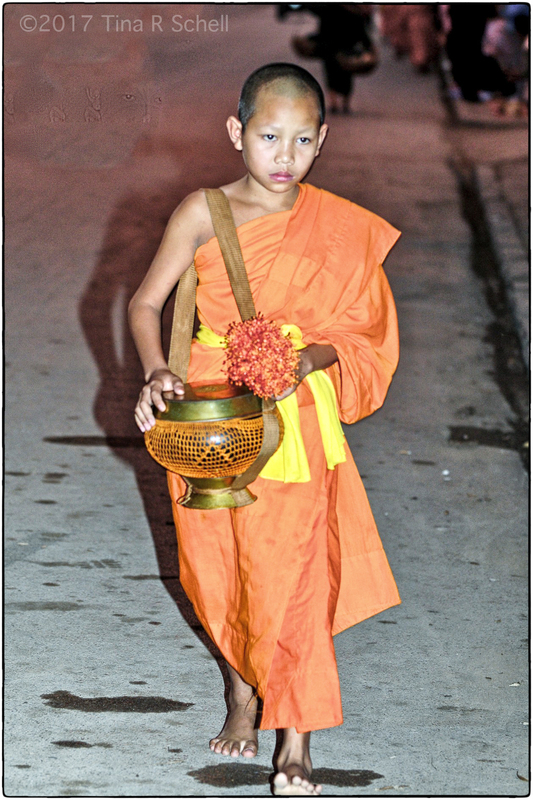 in seeing the young monk. All of the photographs are outstanding but, like you, my favorite is the one with the umbrella’s. What a terrific compliment Izzy, you made my day. Thank you. Tina, these beautiful photos trigger a lot of memories for me. I love the sense of mystery in Through the Looking Glass. Such a beautiful ambience entry! Thanks Amy, glad this one caught your eye. Thanks, Tina. Laos and Luang Prabang was a highlight on our trip. Your great photos take me back to that time.